One of the most Ancient Egyptian artifacts ever found in Greece was discovered on the Holy Island of Crete which further proves that the Egyptians had connections going a long way back with the Cretans who they called the Keiftu and the Greeks called the Phoenicians. A people who I believe were blood-related and ruled the world together for thousands of years. This ancient artifact was buried beneath the Temple of Knossos (Gnosis) where archeologists discovered an ancient alabaster engraved with Egyptian Pharaoh Khian’s upon it in a deposit assigned by Arthur Evans to Middle Minoan III A.9. The remarkable parallels between the Cretan seal designs and the Egyptian scarab-designs were first pointed out by Evans. Seuserenre Khyan (Khian, Khayan or Khan) was said to be the First king of all Hyksos during the Fifteenth dynasty of Egypt. His birthdate is estimated between 1725BCE and 1605BCE. It is said that the supremacy of Egyptian power in the Mediterranean had started right around the reign of Khian. An interesting note is that the supremacy of Crete’s power had started approximately the same time period and lasted for 2,000 years later until Rome and the Caesars conquered Greco-Roman Egypt. Khyan had carried the titles of an Egyptian king, but also the title ruler of the foreign land (heqa-khaset) which was a typical designation of the Hyksos rulers. He was in control of Thebes just like one of his predecessors and descendants, Rekhmire. Khyan symbol was a lion. 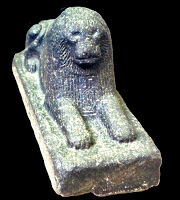 His throne name, Seuserenra, has been found on a grey granite lion which had been built into the wall of a house in Baghdad. In researching the meaning and etymology of words for the last 10 years, I have come to the conclusion that many researchers of modernity have systematically butchered the original meanings out of existence. It has got so bad that I have found that it is much better to just to do your own research well before our modern Babylonian era. As I have explained in numerous articles, the Keftiu is just another name for the Cretans from the island in the sea called Crete which was considered the soul of the world and most powerful island for thousands of years. 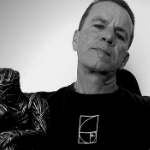 But the facts are the compound word Keftiu is derived from the words Kef or Keph and tiu or tu. 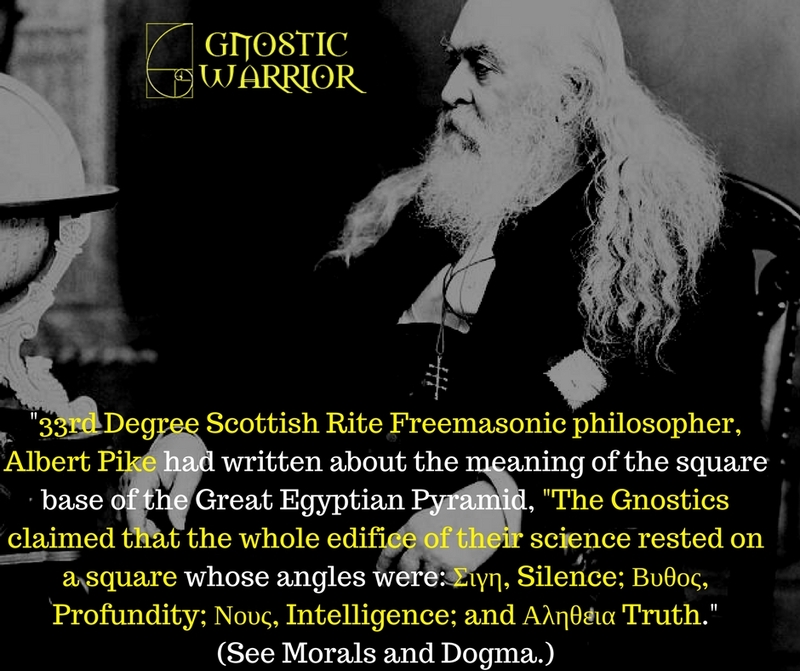 The definition of Tiu we can find is borrowed from the Ancient Greek word – ταῦ (taû) which comes from the 22nd letter of the Phoenician abjad, called taw AKA ?‎ (t) which is the Omega in the 22 letters of the Hebrew alphabet. The taw, X, and t, all signify the mathematical formula the left and right brain bullseye in the 22 bones of the skull that we humans need to create AKA to do which must first happen in the Kef (Kepha) AKA the head. This is why in Middle English tawen, from Old English tawian (“to do, make”), from Proto-Germanic *tawjaną (“to make, prepare”) or the Gothic ?????? (taujan, “to make, prepare”). After all, the Ancient Egyptians had portrayed the Keftiu has the creators and makers of all sorts of crafts, buildings, and statues. Today, science has verified that Crete and the Cretans were essentially the creators of Western civilization in which they would have had to use their heads to do – AKA Kef Tiu. The connections and relations between the Ancient Egyptians and Cretans have been well documented by the historians of yesteryear. I would like to add that I believe the Egyptians were also racially and politically connected to the Cretans through the Thebans. As I have written before, Crete was called Keftiu and Peoples of the Sea in the Ancient Egyptian texts who were often represented by the Egyptians of the XVIIIth Dynasty. The Greeks in the Old Testament called Crete by the name – Kaftor, or Caphtor. The Latins called it Cappadocia and the Arabs called the island Kerith. This same island has also been known by various names over the course of history like Arcadia, Candia, Minoa, Phoenicia, and Phrygia etc. Today, in the tomb of Rekhmire at Thebes, we can find proof of these Cretan (Keftiu) connections that are preserved even to this day and most great researchers concur that Keftiu to be synonymous with Crete. 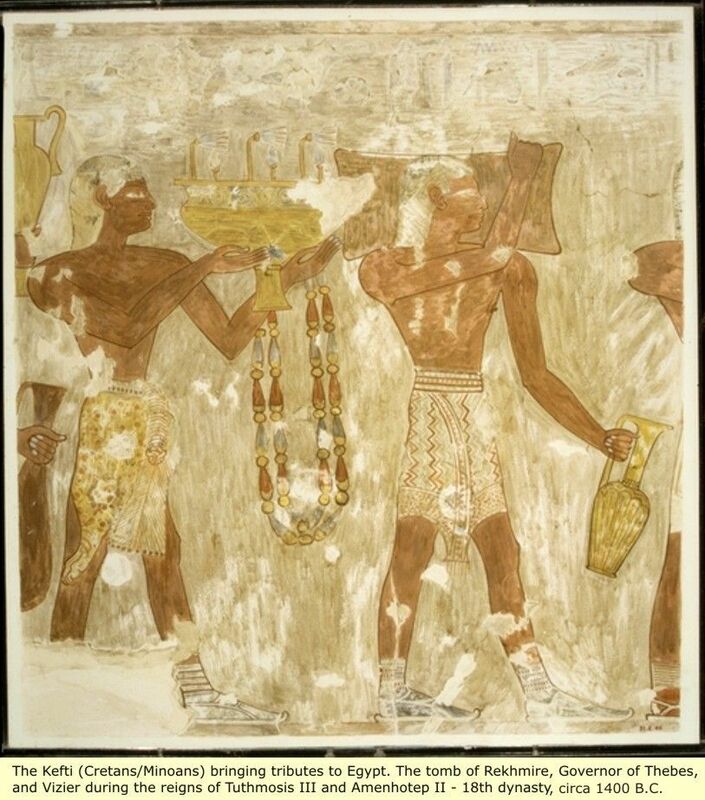 Throughout the tomb of Rekhmire, there are various paintings of fine dark red-skinned Cretan men with both dark brown and blonde hair wearing their symbolic kilts of different colors signifying their various ranks. Some of the men also all wear the upturned sandals with straps, indicative of the Israelites along with colorful leggings. You will also find some of their heads shaven and others with a full head of hair with a carefully designed curl flowing down to their waists which also help signify their rank. The High Priests wore their hair long and the lower ranks of scribes, musicians, masons, and artificers wore their hair short. Today we see a similar tradition in Christianity with the Orthodox Priests of the East wearing their hair long and the Roman Catholic of the West wear their hair short. In these images, we see the Cretans bringing the various products of their fine crafts mainly vessels of gold and silver, jugs, drinking cups, amphorae, and rhytons. They also provide the products they have obtained by trade such as ingots and rings of silver, daggers, chains and pieces of lapis lazuli. The Tribute is piled up at the feet of the scribes who would make records for the Pharaoh and royal court. In the text titles the “Instructions to the Vizier,” we discover that the Egyptian royal court at Thebes had relations with the Island of Crete (Keiftu) whom they also governed and taxed. 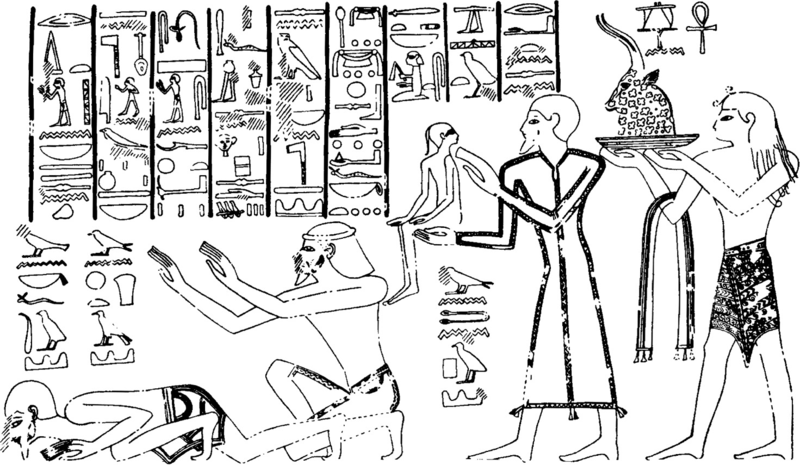 “Receiving the attendants of the Southern regions along those of Punt, the Retenu (Syria-Palestine) attendants, the Cretan attendants, along with the loot from all foreign countries foreign, which has been sent through power of His Majesty, the King of Upper and Lower Egypt (Menkheperre) | living forever, by the Prince, Governor, Great among Greats, Dignitary among Friends, Director of the chief Works, efficient confidant of the sovereign, the one causing he who is in the Palace to praise him and to place him at the head of (his) friends, and as top chief of the entire country, (because) he recognized (him) as one who achieved useful things. The example is for him; his venerable status is before him, the Mayor of the City, the Vizier Rekhmire”. The sovereign, the one whose monuments are perfect. Menkheperre Every office is upheld, regions and cities are established, laws and regulations are enduring for their effects. The children of Dignitaries are in the office of their fathers May he continue (literally again)… to do the same for millions of years. He is durable and stable on the throne of Horus. May he come to repeat the Sed-festival. May he guide the living for eternity”. This text shows that they clear the way for the Vizier who leaves the throne room after the King’s speech. Behind them appears to be a person holding a stick who must have been a guard which has almost completely disappeared. 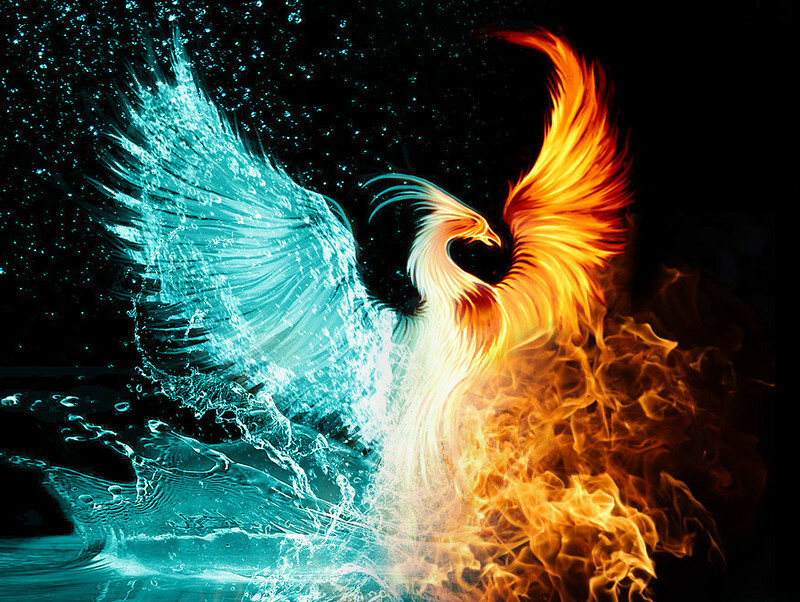 The following spell is from the Egyptian Book of the Dead for being transformed into a phoenix or Benu Bird. The word Dead or Ded, means “firm,” “established.” This quality or condition was greatly desired by the ancient Egyptians for their dead. After death the heart was said to lead an independent existence, journeying alone through the Underworld (Duat) until it met the deceased in the Hall of Judgment presided over by the great God of the dead and King of the Underworld, Osiris. unrelenting in his accusations against the former Egyptian Ministry of Antiquities, Dr. Zahi Hawass. 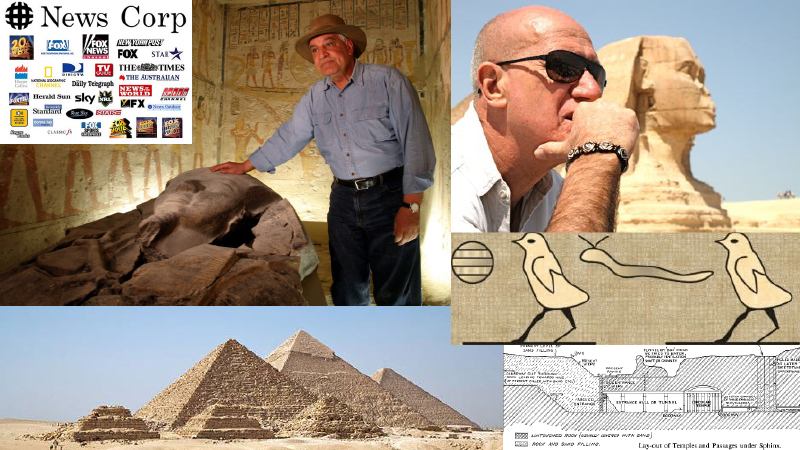 For the past year, Bauval has detailed a strong case against Hawass for his alleged involvement in the theft of the Khufu Cartouche. of Ra. 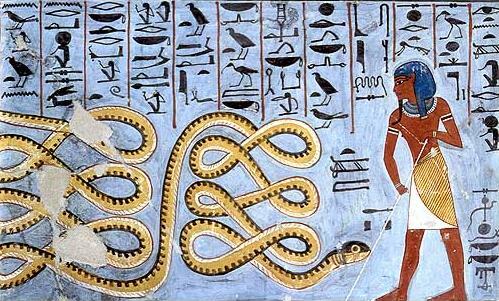 Apep was personified with the darkness of the darkest hour of the night, against which the God of light Ra must not only battle, but fight successfully before he could rise in the east in the morning. kind such as the one described in this story. They have happened before, and may happen again in the future with devastating diseases like the modern day Ebola virus. Recently, a group of Italian archaeologists discovered some telling evidence of an ancient plague at a funerary complex in Luxor, Egypt on the site of the ancient city of Thebes. 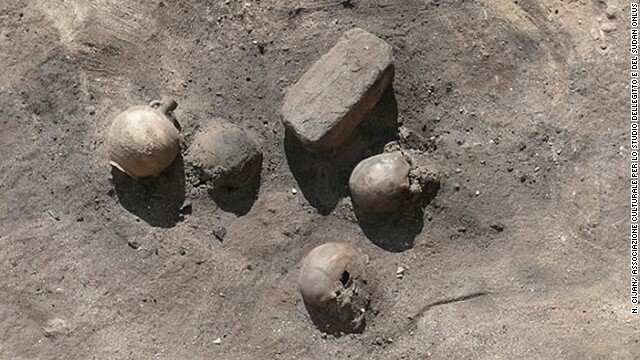 LiveScience reported the human remains that archaeologists found at the site were covered with a thick layer of lime, used historically as a disinfectant. The MAIL researchers also found three kilns where the lime was produced, and more human remains scattered over an area that appears to have been a giant bonfire, in which many of the plague victims appear to have been incinerated. 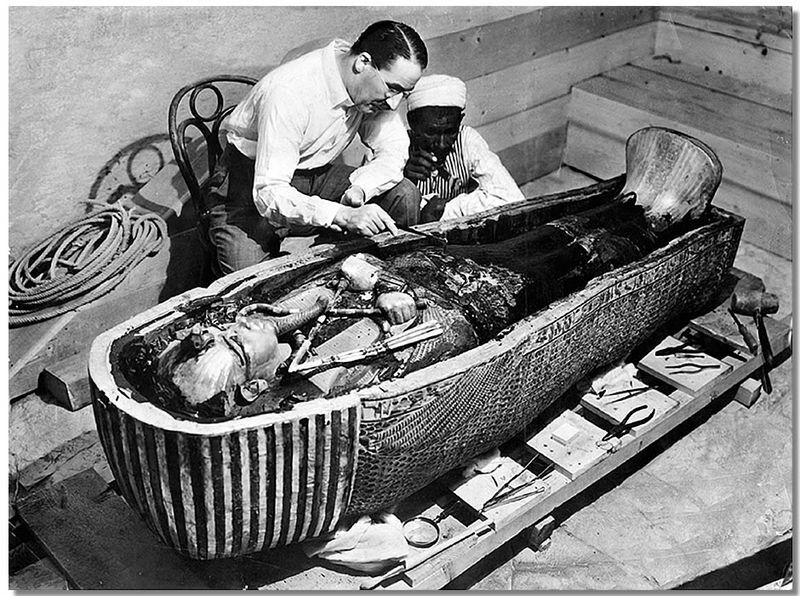 Mummification is otherwise known as the preserving process that cultures such as the Ancient Egyptians had practiced on dead bodies in order to carry them into the next life. It has been thought to have originated approximately 4,600 years ago or in the year 2,600 B.C. Sources such as the Smithsonian, have maintained that the earliest mummies from prehistoric times were probably accidental and formed naturally from the hot and dry environment of the desert.